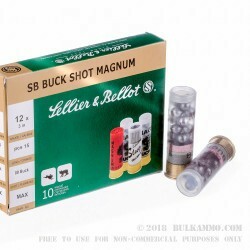 These 3-inch magnum loads from S&B (Sellier & Bellot) are a great option for hitting targets with lots of terminal energy at medium distances such as when fending off coyotes or hunting whitetail deer. 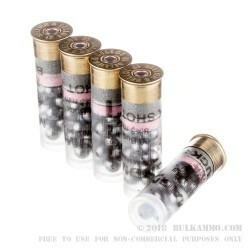 Each shotshell contains 15 pellets of 00 size buckshot pellets which rest atop a recoil-sapping buffer pad in the shell. The moisture-resistant hull that the shot is contained within uses a plastic shot card at its head instead of a traditional crimp in order to reduce costs for hunters. Dependable ignition is facilitated by S&B's proven powder selection and the use of non-corrosive 209 primers. 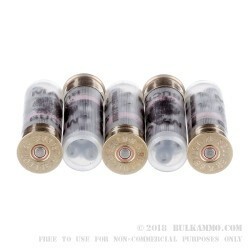 00 buckshot pellets are 8.38mm millimeters in diameter and have long been the choice for camp defense and law enforcement usage due to their sheer effectiveness on targets. Buying in bulk with this 250-round case allows you to get plenty of practice for recoil acclimation and pattern testing from all of your shotguns while leaving plenty leftover for subsequent hunts or home defense duty. 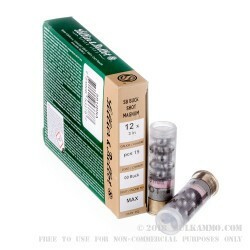 S&B is a Czech company with just under 200 years of manufacturing experience. Their ammunition and components are well-respected across the European sector and highly recommended by professional competitors in the United States.